Please take everything that is being spoken here and all the reference material and weigh it by the scriptures and through prayer. I am simply sharing what I BELIEVE WITH MY HEART and though my studies what the Lord is warning us for this time. In Biblical days they would build walls around their cities for protection. There were men that were stationed at the top of the walls in order to keep watch over the land. These men were called watchmen. 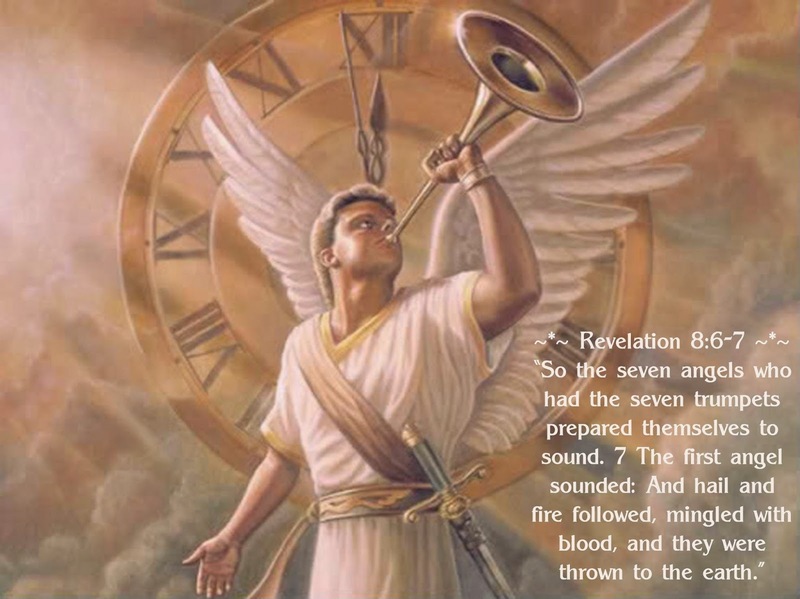 If they saw danger coming they were supposed to blow their trumpets/ shofars and warn the people of the coming danger. I believe there is a sword/ danger coming and I have no choice but to blow the trumpet and warn the people of the danger that I can see on the horizon. I must do this, you see, so that I will not have to stand before the Judge of Heaven with blood on my hands with no excuses worthy enough to be spoken. Sometime in 1996 I had a vision. I was a new Christian and was very impacted and quite frankly dazed for about 3 days after this experience. What I saw was a map of the United States. It was like one of those maps I remember from school where each of the states were a different color. I was looking at the map when a storm appeared on the west coast. It was from North to South and covered the entire west. Within this storm was every type of natural disaster that could be named. There were fires, earthquakes, floods, avalanches, etc. And then the storm began to spread towards the East. It kept spreading across to the East until it had covered all of America. (I am not sure how to put into words the other part that I saw so please forgive me vain attempt to describe it.) There were magnified water drops that came off the map and into my face and as they did I could see the details inside. It was like little spots were being magnified to me. I could see the people drowning, and others crushed under an avalanche, etc. I could see them reaching up and crying out for help. It was horrific. Once the storm had reached the East coast the map disappeared and suddenly I could see my neighborhood again (as I was standing in my doorway when this began). I was completely in shock and asked the Lord Jesus to help me understand what the meaning of this was and also what was I supposed to do with this information. I only felt that it was a picture of things to come and it had to do with “end times”. A couple years later (sometime in the year 2000) I had a similar experience. I saw myself standing in a house that was positioned on the shore of a beach. The wall facing the ocean was all glass. I was standing there with my mom and we were just chatting. Suddenly the Land, Air and Sea all filled with military vehicles, planes, ships, etc. Then I saw a man on an ATV come by with a megaphone and he was yelling out for everyone to stay inside their houses. I knew that the house represented staying in God and that as long as I did I would be safe. Just as with the other time, I knew that was a picture of things to come. On Tuesday August 25th 2015 the Lord began to lead me to certain teachings. As I began to listen to these things my heart became very moved because it was as if everything that I had believed or felt or experienced in my walk with God since I got saved in 1995 was suddenly all linked together and making perfect sense. It was like mysteries that had been kept hidden from me were finally being revealed. Suddenly I could see clearly! I believe that we as Americans have brought the judgments of God to our nation. I believe that we have done many things and sinned greatly against a HOLY God and it is time for Him to respond with judgments. That could come in many different forms. It could come in the form of famines, sicknesses, war, monetary and governmental collapse to name just a few. We could possible see the collapse of our stock market, who knows, maybe even martial law implemented in our nation. I am not sure exactly what form of judgment is coming as it could be any combination of things. All I know is that we have made many terrible decisions that have set us up as a rebellious nation that deserves judgment. Get Right with God! This is the first and absolute most important of all. He says that His sheep know His voice. He says that He will keep us safe in times of trouble. He says that we will walk in peace all the days of our lives. If you have sin in your life (anything at all-sin, un-forgiveness, bitterness, stubbornness, addictions) deal with it. Bring it to the Lord, confess it to Him, accept that Jesus is the perfect Sacrifice and HIS blood that He shed on the cross is enough to cleanse you and reconcile you to the Heavenly Father. Do not let anything stand between you and God. This is not the time to play games with eternity. We must worship, pray and study the Word of God. The HOLY BIBLE. 5. Make an emergency plan for your family. If something happened and you could not communicate with your family you should have a plan of where you would meet each other. I do not wish for this information to bring Fear to any of its readers. I simply want to be obedient to share what I believe the Lord would have me to share. This is a warning. I do not claim that this is the end of the world but I do believe we are stepping across the threshold to the beginning of the tribulation the Bible has foretold. Again, I do not wish for any to be afraid as they read these words but I do plead with you that if you have anything in your hearts and lives that would separate you from the Holy One who’s name is Jesus please Repent! For His Return draws Near! Christina, you love God with all your heart! And you love others. You want others to be saved. You are showing others the way with all your heart and soul. You are a brave and faithful woman who is not afraid share the truth. I admire how much you have poured into your message. Your deeds will not go unnoticed by your father in heaven. Thank you Dignitycounselor for your kind words. Bless you!